Little kids wearing little ears always make me smile. 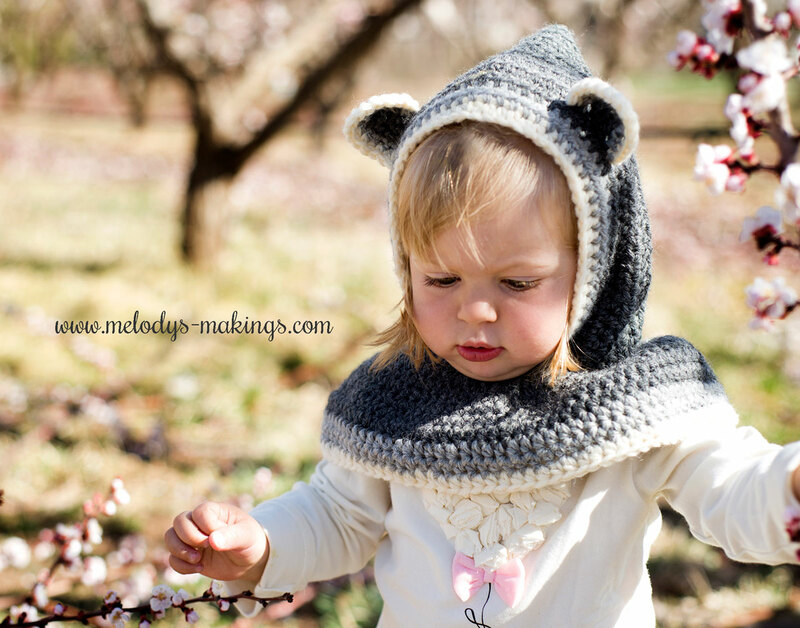 Which is just one of the reasons I love this pattern so much…..this crochet hooded cowl pattern will make your little one irresistible! 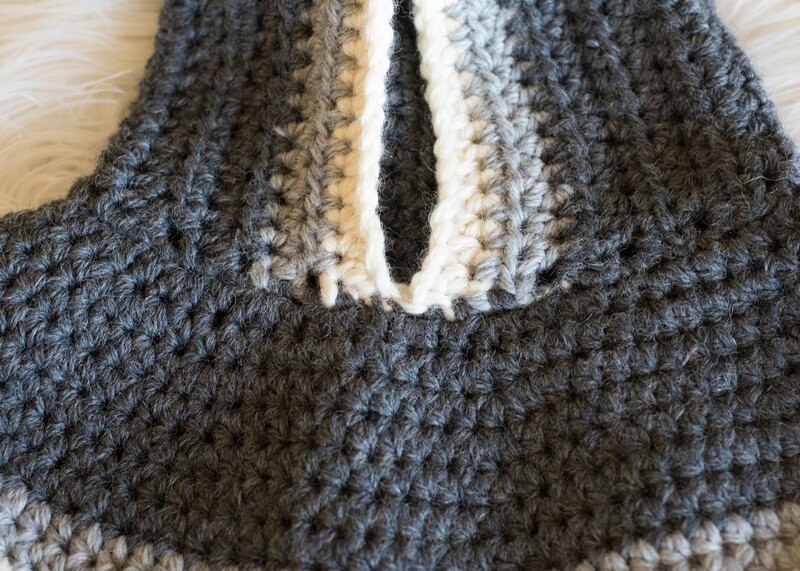 This free hooded cowl crochet pattern comes in both knit and crochet (get the knit pattern here) features bulky (5) weight (or use two strands of your favorite worsted weight) yarn. Repeat row 4 until your project measures approx. 5.5 inches (14cm) in length from the starting edge. Fold your project in half with the right sides together, and either use your yarn or tapestry needle to seam up the back edge, or SC the two sides together to create a seam. Turn your hood right side out. Working along the bottom edge of the hood, starting from the back corner, pick up and SC 28 sts around the base of the hood. When you reach the front corner of the hood, continue by working your next SC into the front corner of the other side (see photo 1). Be sure to evenly spread your sts along the bottom of the hood. When you have picked up all 28 sts, join your project in the round by slip stitching into the first stitch. You will now be working in continuous rounds. Place stitch marker. Pick up color 2 (grey) yarn and add a SC edging around two sides of the piece you just created. You should have a total of 8 grey sts – 3 on each side and 2 in the very top stitch. Cut yarn and secure and weave in ends. Pick up color 1 (cream) yarn and add a SC edging around the same two sides of the piece you just created. You should have a total of 10 cream sts – 3 on each side and 2 in each of the top two sts. 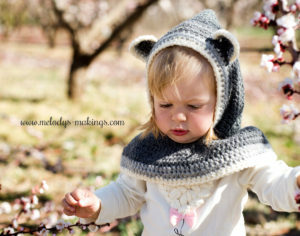 Secure the ears to the top sides of the hood just behind the second row of color 2 (grey) yarn. Repeat row 4 until your project measures approx. 6 inches (15.25cm) in length from the starting edge. Working along the bottom edge of the hood, starting from the back corner, pick up and SC 30 sts around the base of the hood. When you reach the front corner of the hood, continue by working your next SC into the front corner of the other side (see photo 1). Be sure to evenly spread your sts along the bottom of the hood. When you have picked up all 30 sts, join your project in the round by slip stitching into the first stitch. You will now be working in continuous rounds. Place stitch marker. Repeat row 4 until your project measures approx. 6.25 inches (15.75cm) in length from the starting edge. Working along the bottom edge of the hood, starting from the back corner, pick up and SC 32 sts around the base of the hood. When you reach the front corner of the hood, continue by working your next SC into the front corner of the other side (see photo 1). Be sure to evenly spread your sts along the bottom of the hood. When you have picked up all 32 sts, join your project in the round by slip stitching into the first stitch. You will now be working in continuous rounds. Place stitch marker. Pick up color 2 (grey) yarn and add a SC edging around two sides of the piece you just created. You should have a total of 10 grey sts – 4 on each side and 2 in the very top stitch. Pick up color 1 (cream) yarn and add a SC edging around the same two sides of the piece you just created. You should have a total of 12 cream sts – 4 on each side and 2 in each of the top two sts. Repeat row 4 until your project measures approx. 6.75 inches (17cm) in length from the starting edge. Working along the bottom edge of the hood, starting from the back corner, pick up and SC 34 sts around the base of the hood. When you reach the front corner of the hood, continue by working your next SC into the front corner of the other side (see photo 1). Be sure to evenly spread your sts along the bottom of the hood. When you have picked up all 34 sts, join your project in the round by slip stitching into the first stitch. You will now be working in continuous rounds. Place stitch marker. Repeat row 4 until your project measures approx. 7.25 inches (18.5cm) in length from the starting edge. Working along the bottom edge of the hood, starting from the back corner, pick up and SC 36 sts around the base of the hood. When you reach the front corner of the hood, continue by working your next SC into the front corner of the other side (see photo 1). Be sure to evenly spread your sts along the bottom of the hood. When you have picked up all 36 sts, join your project in the round by slip stitching into the first stitch. You will now be working in continuous rounds. Place stitch marker. Repeat row 4 until your project measures approx. 7.75 inches (19.75cm) in length from the starting edge. Working along the bottom edge of the hood, starting from the back corner, pick up and SC 40 sts around the base of the hood. When you reach the front corner of the hood, continue by working your next SC into the front corner of the other side (see photo 1). Be sure to evenly spread your sts along the bottom of the hood. When you have picked up all 40 sts, join your project in the round by slip stitching into the first stitch. You will now be working in continuous rounds. Place stitch marker. Repeat row 4 until your project measures approx. 8.25 inches (30cm) in length from the starting edge. Working along the bottom edge of the hood, starting from the back corner, pick up and SC 44 sts around the base of the hood. When you reach the front corner of the hood, continue by working your next SC into the front corner of the other side (see photo 1). Be sure to evenly spread your sts along the bottom of the hood. When you have picked up all 44 sts, join your project in the round by slip stitching into the first stitch. You will now be working in continuous rounds. Place stitch marker. Pick up color 2 (grey) yarn and add a SC edging around two sides of the piece you just created. You should have a total of 14 grey sts – 6 on each side and 2 in the very top stitch. Pick up color 1 (cream) yarn and add a SC edging around the same two sides of the piece you just created. You should have a total of 16 cream sts – 6 on each side and 2 in each of the top two sts.